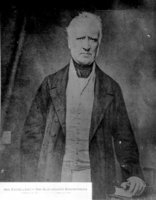 WALSH, KYRAN, Roman Catholic priest; b. c 1808 in County Kilkenny (Republic of Ireland); d. 4 Sept. 1868 at Harbour Main, Nfld. 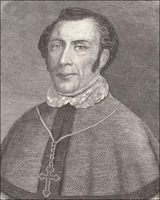 Educated at St John’s College, Waterford (Republic of Ireland), Kyran Walsh came to Newfoundland about 1839 at the invitation of Roman Catholic Bishop Michael Anthony Fleming*, who ordained him sometime prior to 1841. During his service as parish priest at St Mary’s on the southern coast, Walsh was intrumental in the building of a church, a school, and a presbytery. Because of his business ability, he was recalled to St John’s by Bishop Fleming to assist in raising funds for the new Cathedral of St John the Baptist and was present at the laying of the foundation stone on 20 May 1841. 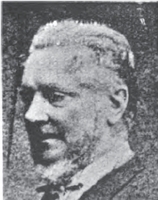 He served in St John’s until about 1857 when he was appointed parish priest at Harbour Main and vicar general of the diocese of St John’s by Bishop John Thomas Mullock, positions he held until his death. Like many of his contemporaries in Ireland, Walsh was a devoted disciple of Father Theobald Mathew, the renowned advocate of temperance. Shortly after his ordination he established a temperance society in St John’s and he continued, by his zeal and example, to support the cause in Newfoundland. Father Walsh was considered by some contemporaries as “the head and centre of the liberal party” after Philip Francis Little*’s retirement as premier in 1858. His influence was certainly not as great as that of the actual party leader, John Kent*, in the late 1850s and early 1860s, but at the local level he exerted formidable pressure which was acknowledged by both political candidates and voters. In the turbulent election contest of May 1861 [see Alexander Bannerman], George James Hogsett, the Catholic Liberal candidate for Harbour Main, admitted that “Father Walsh was one of my most influential supporters,” and voter David Kenny of Cat’s Cove, an erstwhile Conservative supporter, testified that he had voted for the Liberal candidates on the advice of Walsh. During the assembly’s inquiry into the riots at Harbour Main in this election, Walsh himself admitted that he had openly canvassed for Hogsett and Charles Furey, and that on election day he had led a crowd of some 250–300 men from Harbour Main and Salmon Cove to Cat’s Cove as support for Liberal voters from Salmon Cove who feared interference with the poll. The ensuing collision with the people of Cat’s Cove had resulted in one killed and ten wounded. Several weeks after the Cat’s Cove incident a crowd that had attacked the property of the returning officer at Harbour Main, Patrick Strapp, was not persuaded to disperse until Walsh’s return from St John’s, although one witness described him as “an unprotesting spectator” while Strapp’s seven buildings were razed. At his death only the Protestant Liberal newspaper, the Morning Chronicle, spoke at length of Father Walsh’s work in Newfoundland. The brief notes in other St John’s newspapers and the complete lack of reference to Walsh in subsequent histories of the Roman Catholic Church in Newfoundland perhaps indicate that his partisan political activities had caused displeasure inside as well as outside the church. Nfld., House of Assembly, Journal, 1861, app., “Harbor Main election; evidence taken before the select committee appointed to inquire into the contested election for the district of Harbor Main,” 58–92; 1863, app., “Election riots, 1861; commissioner’s report, no 2, district of Harbor Main,” 790. Morning Chronicle (St John’s), 8 Sept. 1868. Newfoundlander, 8 Sept. 1868. Patriot (St John’s), 12 Sept. 1868. Gunn, Political history of Nfld. Elinor Senior, “The origin and political activities of the Orange Order in Newfoundland, 1863–1890” (unpublished ma thesis, Memorial University of Newfoundland, St John’s, 1959), 25, 28. Elinor Senior, “WALSH, KYRAN,” in Dictionary of Canadian Biography, vol. 9, University of Toronto/Université Laval, 2003–, accessed April 24, 2019, http://www.biographi.ca/en/bio/walsh_kyran_9E.html.